UFC superstar Conor McGregor’s boxing skills have drawn criticism from WBA ‘Super’ and WBO lightweight champion Vasyl Lomachenko. McGregor has had only one professional fight, against American legend Floyd Mayweather, that he went on to lose via tenth-round stoppage. 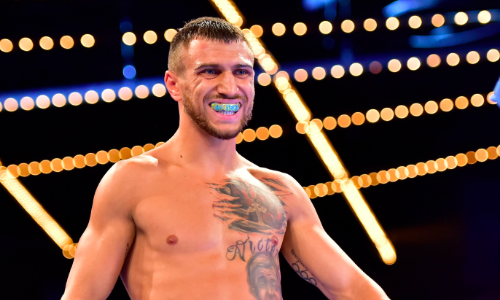 Lomachenko, who weighs 10 pounds ligher than McGregor, believes he would absolutely school the Irishman should the duo ever trade punches. “No, I don’t think [he’s a good boxer],” the Ukrainian ‘Hi-Tech’ told TMZ Sports. “He might be a good boxer in an amateur career, amateur boxing. Three rounds, three-minute rounds, one-minute rest, maybe he is good. But in professional boxing? No. But would he move up to 145 lbs to face McGregor? “With him? Yeah, no problem,” he says. Meanwhile, Lomachenko (12-1-0, 9 KOs) is scheduled to defend his belts against Britain’s Anthony Crolla (34-6-3, 13 KOs) at Staples Centre, Los Angeles, on Friday night. Although Crolla’s experience promises to test Lomachenko’s maverick style, the latter is largely expected to retain his belts. Will there be an upset on display though? We shall know soon.